SUPERFREEZE SDM-Series In accordance with ANSI/ASHRAE 15-1994 Safety code for mechanical Refrigeration, pressure vessels having 10 cubic feet or more of internal gross volume, shall be fitted with dual pressure relief valves. 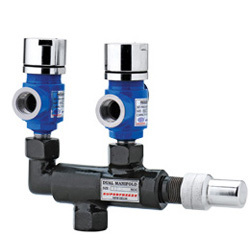 This is typically accomplished using a pair of pressure relief valves inter connected via a three way dual Manifold. In this one valve remains operational, while the other is being replaced there by eliminating the need to remove refrigerant from the vessel. These valves facilitate the parallel installation of pressure relief valves. Because three way valves will not isolate both pressures relief valves simultaneously, they are considered the only acceptable type of shut-off valve for use with refrigerant relief piping. Inlet and out let connections are threaded female.The valve stem should be positioned so that only one Pressure relief valve is activated. While the valve can be either front-seated or back-seated, the back-seated position is recommended for normal use because it takes pressure off the packing and reduces the possibility of packing leak. No isolation valve required, which give more safety to the pressure vessel with at least one relief valve in operation. One valve can be removed for repairs at any time.